I can't hear Rocket Man by Elton John without thinking about sitting on the plane with my mom, dad and sisters on our way to Japan. The flight from New York to Japan took 13 hours. The Contemporary Music playlist I chose to listen to from the airlines's music menu probably had about 9 other songs on the list. By the time we got to Japan and back, I probably listened to Rocket Man at least 26 times! The song gives me a warm and comfortable feeling and reminds me of how fortunate I was to have had the opportunity to enjoy many wonderful family vacations. There are other vacation memory joggers. We take as many pictures as we can to refresh our memories of our vacations and photos are absolutely one of the best memory joggers. So are the souvenirs we buy. I remember the many small shops me and Soko ventured into searching for the perfect serving dish when we were in Mexico. (Read about it here.) Every time I use that dish, I remember how very patient Soko was with me, and really supportive actually, as I ran in and out of every store in the shopping center. When I finally found the perfect shop with the perfect dish, I wound up not only buying a dish for us but found dishes for our kids, my mom and my sister. Soko followed me around carrying the heavy load I was piling up on him without even the slightest complaint. It's a great memory for me. I'm not sure it is for Soko though! But there is something about music and the power it has to not only conjure up memories but emotions and feelings associated with those memories. When I hear Rocket Man, a wave of nostalgia sweeps over me. When I hear the song Happy by Pharrell Williams I get an instant joyful memory of my son's wedding. He surprised me by asking the DJ to play my favorite song even though he assured me it would not be played at his wedding. Not only did it make me feel extremely happy but we had almost every wedding guest dancing in a conga line around the venue, including my mom being pushed in her wheelchair! 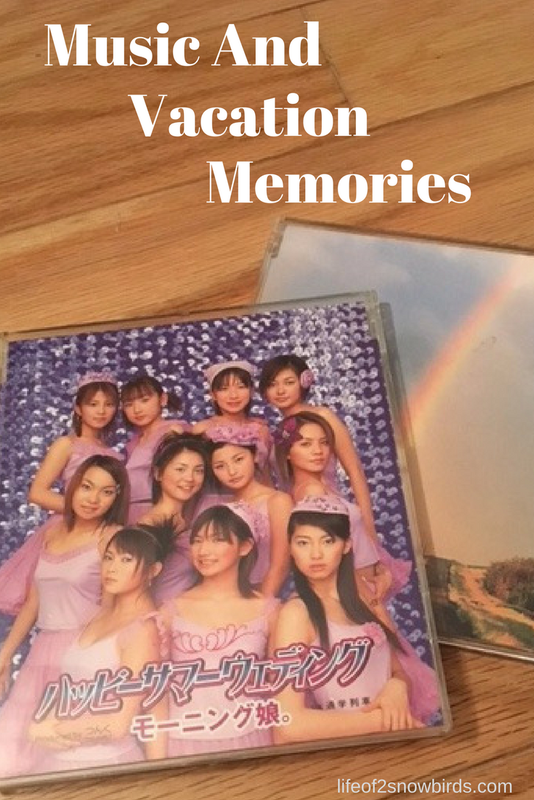 Some of my favorite music is from the CD's I bought in Japan. We always stayed at my Obaachan's (grandma) house when we visited. We traveled by mass transit when we needed to get anywhere. The train station was a few blocks from Obaachan's house. The block that led to Imazato Station was lined with little mom and pop shops, two grocery stores, small noodle shops that served the most delicious food and the record shop on the corner. The record shop would play the current hits and play them so loudly that you could hear the music halfway down the block. We would start to recognize the songs because we would be in this area almost every day. With the help of family and friends we were able to buy the CD's of the music we were hearing all the time. I am so happy to have these CD's because of the wonderful memories and the instant warmth that comes over me when I listen to them. I will definitely be looking for music to bring back with me when me and Soko go to Italy next year. Maybe the gondolier in Venice has a CD of the love songs he will be singing as we relax on his gondola. I'm sure listening to that CD will conjure up some very romantic memories! This post was inspired by composer and screenwriter John Ross Jesensky. Read about the John Jesensky Scholarship which is open to high school seniors or current college students. I think one of the best things about music is the memories we have when we hear it! Great post! (no I have Rocket Man stuck in my head)! Thank you for sharing at Celebrate It! Hahaha! That's another interesting thing about music that you can sometimes get a song stuck in your head and can't get it unstuck! Thank you for hosting an awesome party!